NEW YORK, November 27, 2012- Though China and India are known for their explosive growth rates and impressive achievements in social and economic development, much of the world continues to watch with apprehension as growing industry in both nations degrades natural resources and ecosystems. 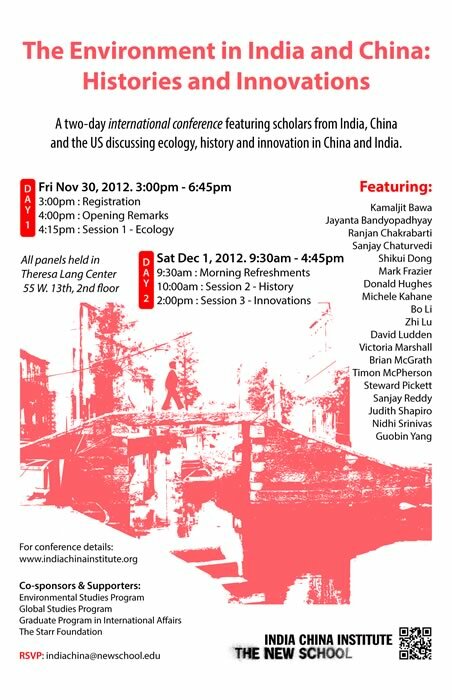 The New School's India China Institute (ICI) will address issues of resource management and environmental sustainability at a conference entitled The Environment in India and China: Histories and Innovation. The conference will take place from November 30 from 3:00 p.m.- 7:00 p.m. and December 1 from 9:00 a.m. – 6:00 p.m. at The New School's Theresa Lang Community and Student Center on 55 West 13 Street, 2nd floor. "We are proud to host such distinguished experts to contribute to our understanding of how to create a sustainable environment in the world’s fastest growing economies," said ICI Director Ashok Gurung. "This conference draws on the interdisciplinary nature of The New School, and gives opportunity for scholars and activists alike to combine theory and research with real-world situations." The conference has three themes, Ecology, History and Innovation. For the first theme, the concept of ecology is analyzed through meaning, metaphors and models in order to better understand the interaction of markets with state policies and the ecosystem. The second theme, history, will focus on changing environmental views of each region and the local beliefs towards the natural world. Finally, in the innovation section, speakers will explore the ways individuals and groups engage with growing environmental problems by creating or refurbishing new technological and organizational systems. Steward Pickett, Plant Ecologist at the Cary Institute of Ecosystem Studies in New York. This event is co-sponsored by The New School's programs in Environmental Studies and Global Studies, and the Julien J. Studley Graduate Program in International Affairs. It is generously supported by the Starr Foundation. Established in 2004, ICI is emerging as the hub of an international network of institutions and activities that nurture conversations and interactions about India, China, and the United States and deepen our understanding of global processes. Made possible in part by a grant from the Starr Foundation, ICI is committed to analyzing major issues and trends in India, China, and the United States and helping leaders, scholars, public intellectuals, and opinion builders in all three countries address key challenges through collaborative solutions. Currently, ICI's 15 distinguished fellows are collaborating on a broad range of projects to address the topic of "Prosperity and Inequality: Debates in India and China." For more information, visit www.indiachinainstitute.org.